As a landscape architect, I cringe when I see massive engineering and infrastructure projects that demonstrate no sensitivity to the site, ecology, or culture. Solar power and renewable energy projects are no exception. There needs to be a better way to deploy large scale solar energy projects that reduce their cultural and ecological impact on the landscape. There is an interesting etymology emerging for solar power projects that have agricultural and ecological imagery. Solar farms, solar groves, solar forest, solar trees, solar ranch, and bright fields, all evoke sylvan or pastoral landscapes while the reality is anything but that in most cases. If we play this game – solar orchards, solar gardens, solar bosques, solar glens, solar dell, solar pastures, solar glades, solar forest, solar plantation, solar jungles, solar meadows, solar pastures, solar shrubs, solar trees, and perhaps solar topiaries – may all soon to join the lexicon of solar projects for better or worse. Compared to most other forms of energy, solar farms have one of the lightest impact no mater how you slice it – EROEI, LCA, area per watt, co2e/watt or btu, et cetera. Robert Bryce got the math wrong by ignoring the baseline of fossil fuel impacts in his June NYTimes Op-Ed. Yes – solar and wind farms require large areas (if not build in urban areas), but their footprints are minimal compared to fossil fuels which require equally large areas that are usually hidden from public view – from the mines/oil fields, to processing plants/refineries, pipelines, tank farms, and then there is the area contaminated downwind and down stream that Bryce is paid to ignore. Okay, there are toxic byproducts of both thin film and silicon cell production, but again, these are significantly lower per watt then most other forms of energy production. Yes, solar energy development may require removal of vegetation over tens of square miles (which impacts the ability to keep the mirrors clean), digging the point foundations for the heliostats (see image below) & turbines, and depletion of groundwater to keep the panels/mirrors clean. But compared to the other renewable energy systems, solar’s environmental impacts are an order of magnitude less then wind farms which sprawl over much more land, mix the atmosphere, require massive foundations and structures, and create noise problems to name just a few issues; or are several orders of magnitudes less then hydropower and most biofuels. Energy sprawl is real, but don’t blame wind or solar. Still, this small footprint isn’t good enough, but now there is hope for integrating photovoltaics into our cultural landscape. 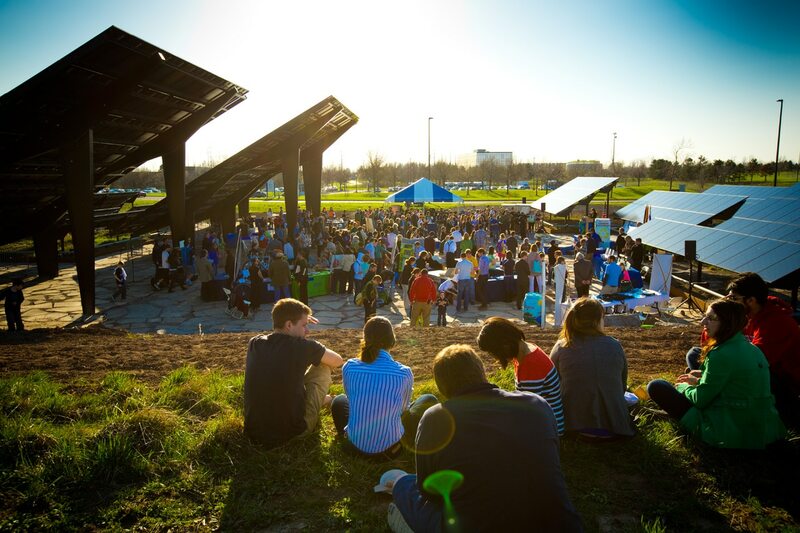 Walter Hood has created one of the most engaging solar installations to date at the University of Buffalo, that provides a new paradigm for designing solar installations as both cultural and ecological places. 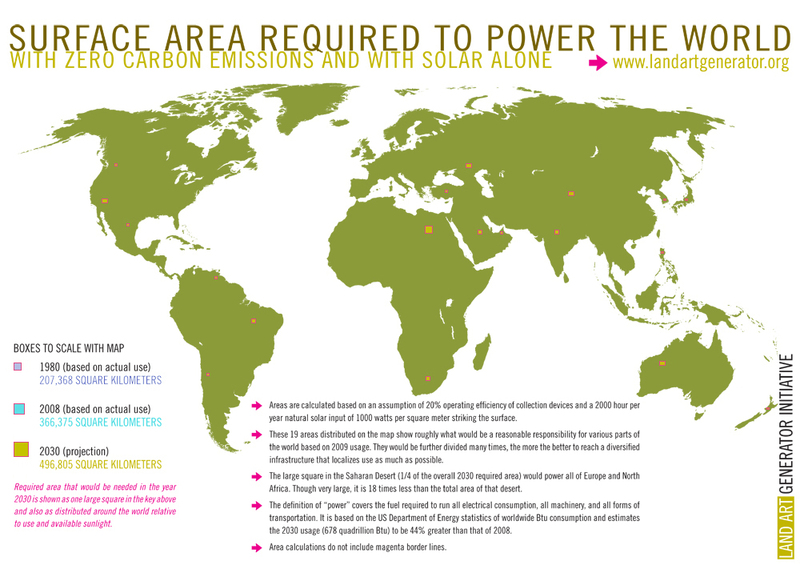 The Solar Strand is both an energy field with an 1.1 megawatt array of PVs and a park. Never thought of Buffalo as being the sunniest city in the Northeast! Hood’s design was the winner of a competition that had Vito Acconci and Diane Balmori as runner ups. 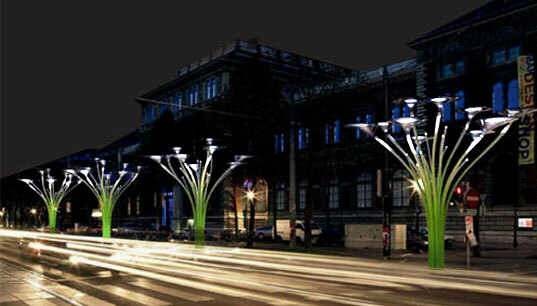 Industrial design genius, Ross Lovegrove (of the sony walkman fame) has started deploying System X modular lighting aka ‘Solar trees’ around the Vienna and other EU cities. While the energy production of each tree isn’t very significant, they redefine street furniture and are zero energy street lighting that appear to be dark sky friendly. There are a entire menagerie of solar powered lights/street furniture now available – but the urban forest is far from going solar yet. 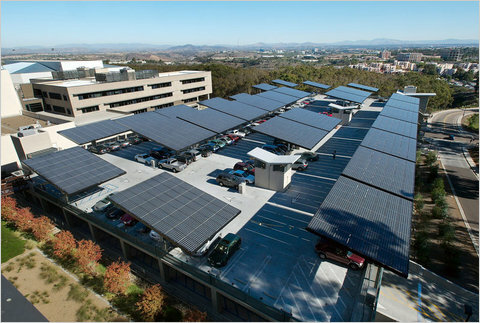 Suburban landscapes are starting to see ‘solar groves’ sprout over parking lots. While this is old news (as seen in the NYTimes here & here) – these groves and forests have intriguing potential to be transcendental places and significantly reduce the urban heat island (or at least cooler parked cars). At the other end of the scale spectrum, there is an inherent sublime beauty to many large scale solar thermal projects – especially the 2nd and 3rd generation plants like Solucar where the engineering transcended utilitarianism for good design. Beyond the iconographic qualities, there is also the engaging dynamics of heliostats tracking the sun and the visceral direct connection between energy and the sun that is worth celebrating. 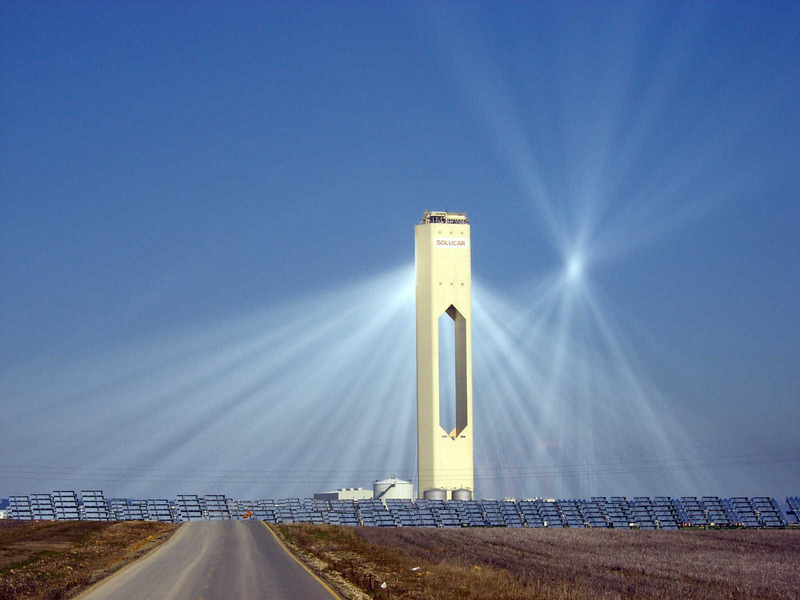 Abengoa Solar’s PS-10 Solar Tower. Technology owned by Abengoa Solar, S.A. (Abengoa Solar S.A. © 2015, All rights reserved). There are almost 3 dozen solar energy projects staking claim on 300,000 acres of BLM land in the Mojave Desert in various phases of approval according to the California Energy Commission. If built, these projects are slated to generate 24,000 megawatts in perpetuity [see the footnote below for comparison with tar sands] . The Mojave Desert is prime habitat, is a well used recreation area, and has significant cultural meaning, so demands more then just business as usual when it comes to the planning and implementation of these projects. The future of solar energy projects should not keep on making the same glaring mistakes of the first generation solar farms built on previously undeveloped sites that were engineered for just one purpose – destroying habitat and are ugly. We don’t have enough land for that. In contrast (and ignoring all EROEI/transmission loss), the existing Athabasca tar sands have destroyed about 100,000 acres of wilderness, just to produce 1.25 million barrels of oil a day for the next few years, equivalent to only about 2 million megawatts/hours (plus half a million tons of CO2/day and millions of gallons of polluted water). 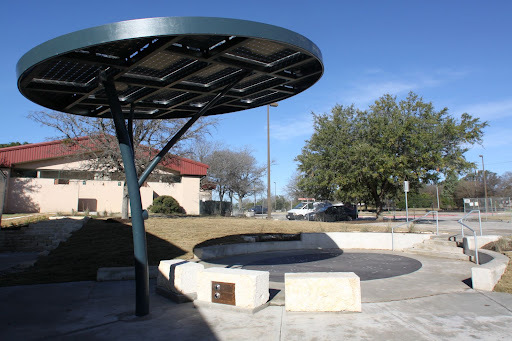 This entry was posted in culture, ecology, energy, Infrastructure, Owens Lake, policy, practice, water and tagged Bright Fields, Land Art Generator, Solar farms, solar forest, solar groves, Solar Parking Canopy, solar trees, Walter Hood by Barry Lehrman. Bookmark the permalink. reading this again the title seems note-worthy. it seems you are suggesting going beyond the productive surface? in terms at least of metaphor would you agree? is the idea of productive to closely linked to farming, monoculture(s) and centralized scale? Can one have a more distributed/diffused productive surface? multifunctional productive ‘surfaces’ are possible. Diffusion is an interesting lens, as I’m all for integrating infrastructure and ecology into the built environment.